منجشیرینی, مصطفی, مصطفی‌زاده فرد, بهروز, سالاری, امیر, لندی, اسماعیل. (1395). تأثیر شوری آب آبیاری بر عملکرد و اجزای عملکرد ذرت با استفاده از سامانه آبیاری قطره‌ای نواری. نشریه آبیاری و زهکشی ایران, 10(1), 83-93. مصطفی منجشیرینی; بهروز مصطفی‌زاده فرد; امیر سالاری; اسماعیل لندی. "تأثیر شوری آب آبیاری بر عملکرد و اجزای عملکرد ذرت با استفاده از سامانه آبیاری قطره‌ای نواری". نشریه آبیاری و زهکشی ایران, 10, 1, 1395, 83-93. منجشیرینی, مصطفی, مصطفی‌زاده فرد, بهروز, سالاری, امیر, لندی, اسماعیل. (1395). 'تأثیر شوری آب آبیاری بر عملکرد و اجزای عملکرد ذرت با استفاده از سامانه آبیاری قطره‌ای نواری', نشریه آبیاری و زهکشی ایران, 10(1), pp. 83-93. منجشیرینی, مصطفی, مصطفی‌زاده فرد, بهروز, سالاری, امیر, لندی, اسماعیل. تأثیر شوری آب آبیاری بر عملکرد و اجزای عملکرد ذرت با استفاده از سامانه آبیاری قطره‌ای نواری. نشریه آبیاری و زهکشی ایران, 1395; 10(1): 83-93. استفاده از آب­های نامتعارف از جمله آب­های شور جهت آبیاری، با توجه به افزایش روز افزون تقاضای آب مخصوصاً در مناطق خشک و نیمه­خشک امری اجتناب­نا­پذیر است. به­منظور بررسی اثر شوری آب آبیاری با استفاده از سامانه آبیاری قطره­ای نواری (T-Tape)بر عملکرد و اجزای عملکرد ذرت، چهار تیمار شوری آب آبیاری 2، 6، 9 و 12 دسی­زیمنس بر متر در قالب طرح بلوک­­های کامل تصادفی با سه تکرار برای هر تیمار، در سال زراعی 92-1391 در شهرستان سبزوار به­صورت میدانی اجرا گردید. نتایج نشان داد که افزایش شوری آب آبیاری موجب کاهش معنی­دار عملکرد دانه، تعداد دانه در بلال، ارتفاع، وزن خشک، سطح برگ، باروری بلال، قطر بلال، تعداد ردیف در بلال، وزن صد دانه و شاخص برداشت گردیده است. به ازاء یک واحد افزایش شوری آب آبیاری، ارتفاع، وزن خشک و سطح برگ گیاه به ترتیب 94/1، 16/6 و 85/1 درصد کاهش یافت. حد آستانه شوری (a) و شیب خط (b) کاهش عملکرد نسبت به شوری برای ذرت در منطقه مورد مطالعه به­ترتیب 6/1 دسی­زیمنس بر متر و 3/9 درصد به­دست آمد. حد آستانه پایین و شیب زیاد کاهش عملکرد نسبت به شوری نشان­دهنده حساسیت بالای ذرت نسبت به شوری است. Abood,M.A. 1978. Analysis of corn yield components for salinity and moisture treatments. Dissertations. Abstract International. 38. 12: 5683. Amer,H.K. 2010. Corn crop response under managing different irrigation and salinity levels. Agricultural Water Management. 97:1553-1563. Bresler,E., McNael,B.L and Carter,D.L. 1982. Saline and Sodic Soils: Principles, Dynamics-Modeling. Springer-Verlag, Berlin, 236 pp. Castrignano,A., Katerji,N., Karam,F, Mastrorilli,M and Hamdy,A. 1998. A modified version of CERES-Maize model for predicting crop response to salinity stress. Ecological Modelling, 111:107-120. Cha-Um,S and Kirdmanee,C. 2009. Effect of salt stress on proline accumulation, photosynthetic ability and growth characters in two maize cultivars. Pakistan Journal of Botany, 41:87–98. Dai,X., Huo,Z and Wang,H. 2011. Simulation for response of crop yield to soil moisture and salinity with artificial neural network. Field Crops Research. 121:441-449. Ghane,E., Feizi,M., Mostafazadeh-Fard,B and Landi,E. 2009. Water productivity of winter wheat in different irrigation/planting methods using salin irrigation water. Journal of Agricultural Biological. 11:131-137. Hanson,B and May,D. 2004. Effect of subsurface drip irrigation on processing tomato yield, water table depth, soil salinity, and profitability. Agricultural Water Management. 68:1-17. 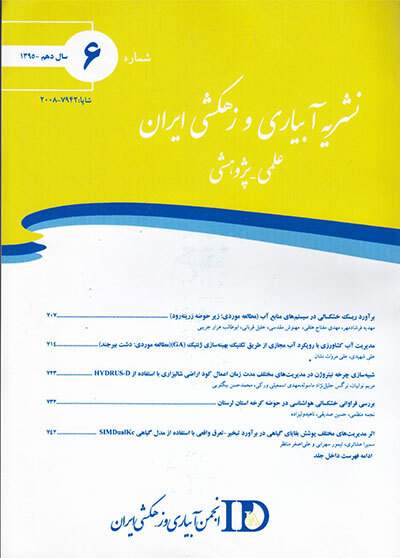 Heidarpour,B., Mostafazadeh-Fard,B., Arzani,A., Aghakhani,A and Feizi,M. 2009. Effect of irrigation water salinity and leaching fraction on yield and evapotranspiration in spring wheat. Soil Science and Plant Analysis. 40:2521-2535. Jiang,J., Huo,Z., Feng,S and Zhang,C. 2012. Effect of irrigation amount and water salinity on water consumption and water productivity of spring wheat in Northwest China. Field Crops Research. 137:78-88. Kang,Y., Chen,M and Wan,S. 2010. Effects of drip irrigation with saline water on waxy maize (Zea maysL. var. ceratina Kulesh) in North China Plain. Agricultural Water Management, 97:1303-1309. Katerji,N., van Hom,J.W., Hamdy,A., Karam,F and Mastrorilli,M. 1996. Effect of salinity on water stress, growth and yield on maize and sunflower. Agricultural Water Management. 30:237-249. Keller,J and Bliesner,R.D. 1990. Sprinkle and trickle irrigation, Avi Book pub. NewYork. 652 pp. Mass,E.V and Haffman,G.J. 1977. Crop salt tolerance-Current assessment. Journal of Irrigation and Drainage Division. 103:114-134. Mostafazadeh-Fard,B., Heidarpour,M., Aghakhani,A and Feizi,M. 2008. Effect of leaching on soil desalinization for wheat crop in an arid region. Plant Soil Environment. 54:20-29. Mostafazadeh-Fard B., Mansouri,H., Mousavi,S.F and Feizi,M. 2009. Effect of different levels of irrigation water salinity and leaching on yield and yield components of wheat in an arid region. Journal of Irrigation and Drainage Engineering. 135.1:32-38. Munns,R. 2002. Comparative physiology of salt and water stress. Plant Cell Environ. 25:239–250. Ould Ahmed,B.A., Inoue,M and Moritani,S. 2010. Effect of saline water irrigation and manure application on the available water content, soil salinity, and growth of wheat. Agricultural Water Management. 97:165-170. Pasternak,D., Sagih,M., DeMalach,Y., Keren,Y and Shaffer,A. 1995. Irrigation with brackish water under desert conditions XI. Salt tolerance in sweet-corn cultivars. Agricultural Water Management. 28:325-334. Wan,S., Jiao,Y., Kang,Y., Hu,W., Jiang,S., Tan,J and Liu,W. 2012. Drip irrigation of waxy corn (Zea mays L. var. ceratina Kulesh) for production in highly saline conditions. Agricultural Water Management. 104:210-220.